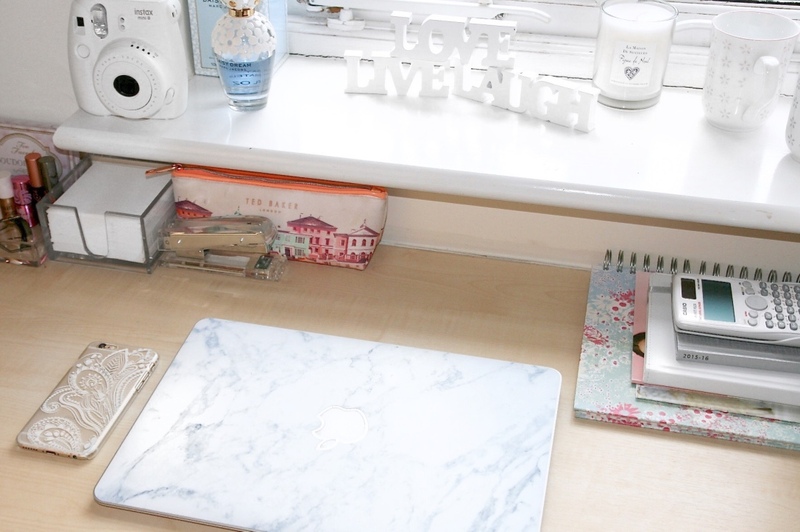 So firstly I am sorry for the lack of posts this last week, but as you might have guessed by the title of this post I have finally moved into my new uni house! I am living with 8 (I know, it's a big house!) of my best friends from uni last year and my bedroom is on the very top floor. 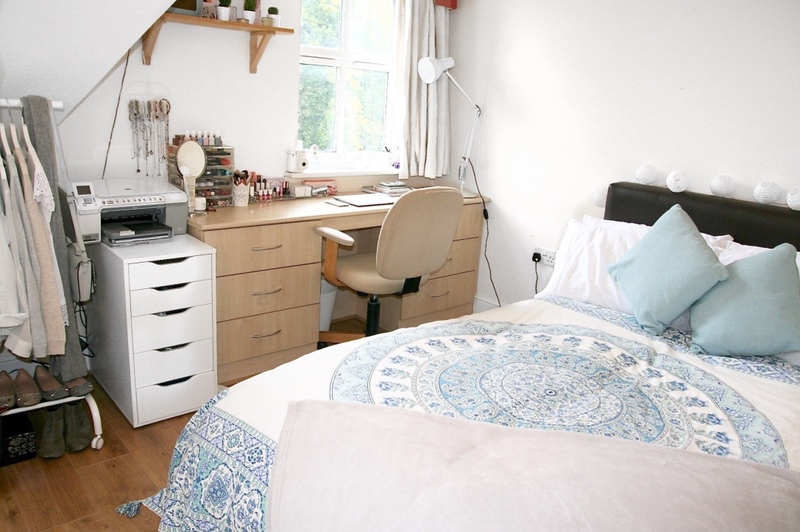 I love looking at how people have decorated their bedrooms and their homes so I thought I would finally share with you a few pictures of my new bedroom. So this is basically what you see when you open the door and walk into my bedroom. I have a nice big bed in the middle of the room and then my desk and work area over in the corner. I've get the decor as light as possible to make the space feel bigger so as can only be expected there is a lot of white and pastel! 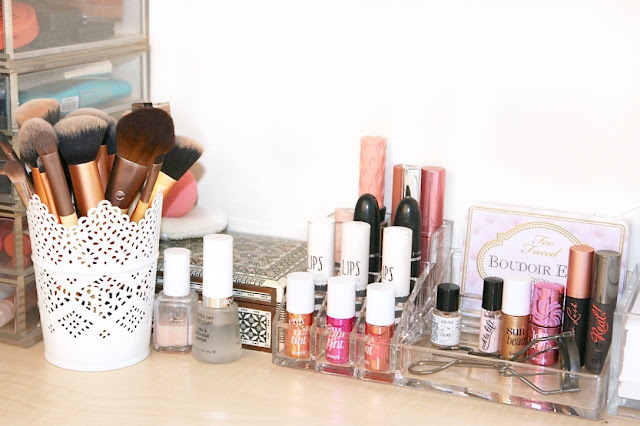 On one end of my desk I have created like a dressing table area with all of my makeup and some beauty bits. I actually brought pretty much all of my makeup with me to university so I have everything that I could ever need. 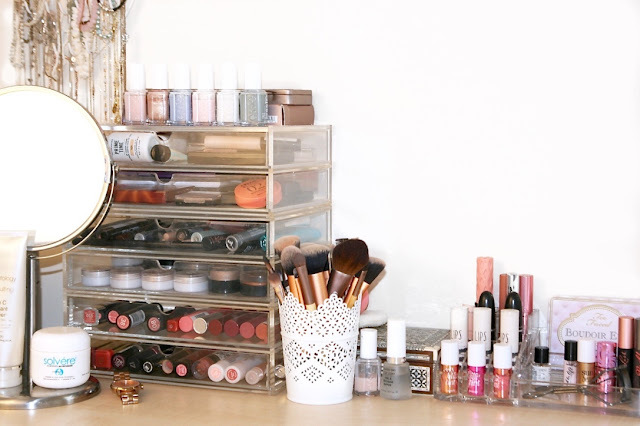 In the morning and before nights out I will just scoot my chair over to this end of my desk and do my makeup using my little desk mirror. I love having a lot of pretty pastel thinks like jewellery, makeup and nail polish on show as it adds detail and makes the room feel homely and girlie. On the other end of the desk I have my work area with my laptop, notepads and pens. I find it easier to keep all my uni books and folders away in my cupboard and take them out as and when I need them. My desk isn't huge so this way it feels tidier and I have more space. 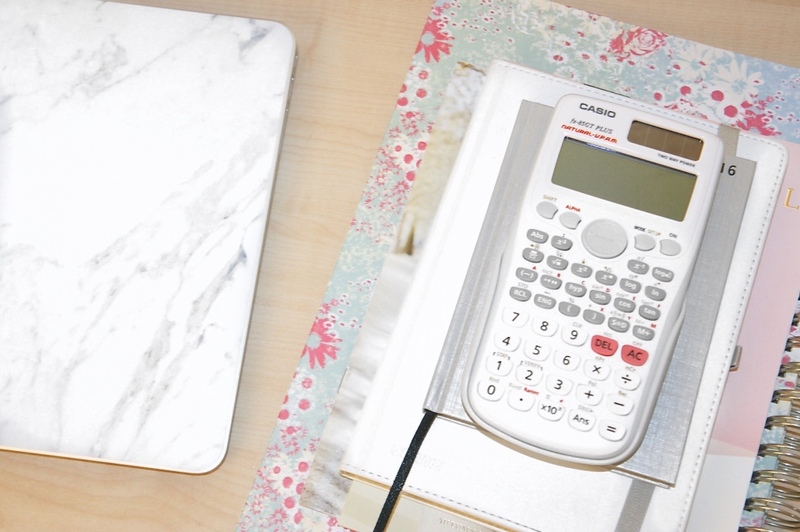 I actually bought this new calculator the other day. I remember being about twelve years old and being desperate for the bright pink one! Now I got just as much job buying the beautiful new white one to go with my desk space! I have a little bedside table where I keep a few bits and pieces. 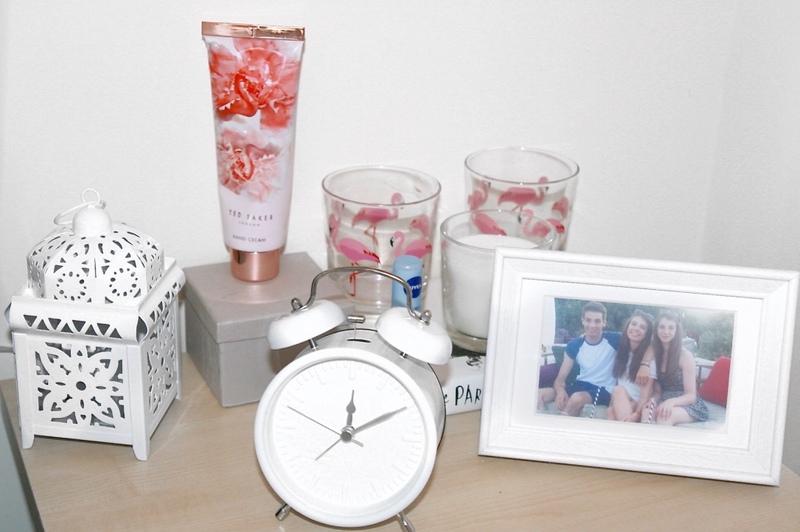 I have my white alarm clock, my lantern, glasses, a candle and my favourite photo of my brother and sister. I also have some lip balm and hand cream which I always use before bed, and then all my other bedtime beauty bits are in the drawers. Finally just above my desk I have this little shelf space. 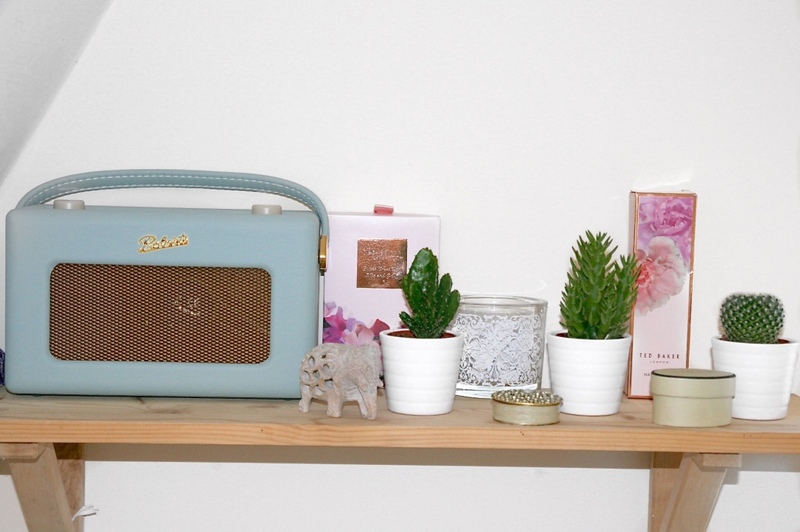 Here I have put my Roberts Radio on display as the colour goes perfectly with my throw. I have some beauty bits, some of my favourite jewellery and then my cacti which I just love! Which reminds me, they could probably do with a bit of water! There is actually a little corner of my bedroom that I haven't included in this post. 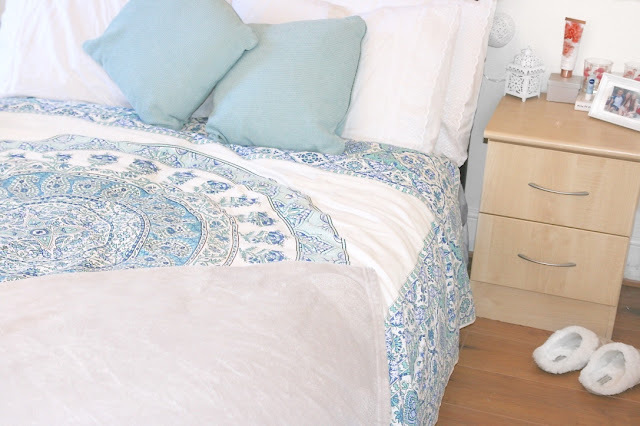 Do avoid making this post too long, and because it is my favourite part of my bedroom I am going to include these pictures in a whole separate post. So keep an eye out as that will be on the blog in the next few days.